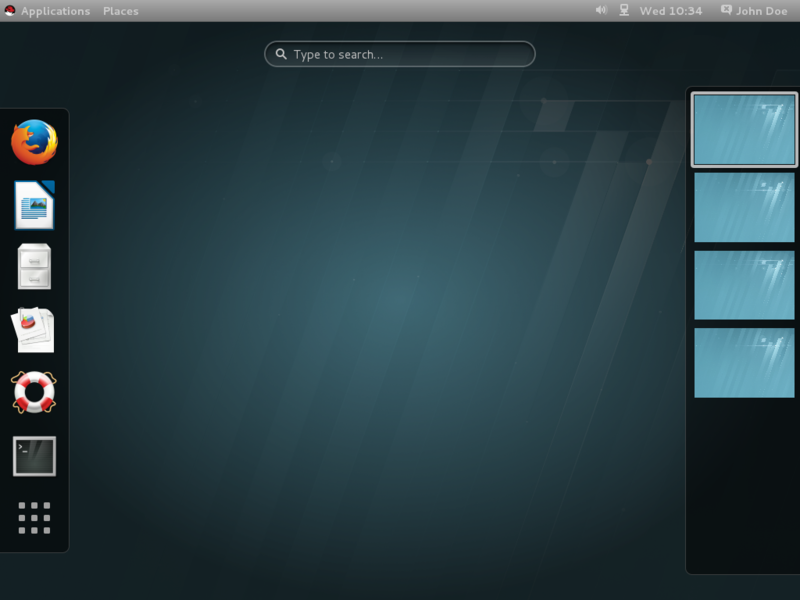 Red Hat Enterprise Linux 7 features the next major version of the GNOME Desktop, GNOME 3. The user experience of GNOME 3 is largely defined by GNOME Shell, which replaces the GNOME 2 desktop shell. Apart from window management, GNOME Shell provides the top bar on the screen, which hosts the "system status" area in the top right, a clock, and a hot corner that switches to Activities Overview, which provides easy access to applications and windows. The default GNOME Shell interface in Red Hat Enterprise Linux 7 is GNOME Classic which features a window list at the bottom of the screen and traditional Applications and Places menus. For more information about GNOME 3, consult GNOME help. To access it, press the Super (Windows) key to enter the Activities Overview, type help, and then press Enter. For more information about GNOME 3 Desktop deployment, configuration and administration, see the Desktop Migration and Administration Guide. GNOME 3 uses the GTK+ 3 library which can be installed in parallel with GTK+ 2. Both GTK+ and GTK+ 3 are available in Red Hat Enterprise Linux 7. Existing GTK+ 2 applications will continue to work in GNOME 3. Red Hat Enterprise Linux 7 introduces a lightweight graphical desktop virtualization tool used to view and access virtual machines and remote systems. GNOME Boxes provides a way to test different operating systems and applications from the desktop with minimal configuration.